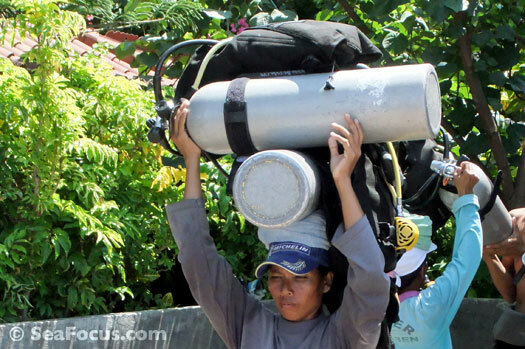 We have been travelling to Bali for well over 20 years and have watched the diving industry grow and develop. Years ago, there were just a handful of dive operations with offices located around the popular south coast beach areas. It didn't matter where you stayed, as these companies would collect customers in the morning then drive to the dive site. As time has gone on, this system has changed little. There are a few dedicated dive resorts dotted around the island, but far more companies offer this flexible system: stay where you like and go diving with whoever you want. With offices located in trendy Seminyak on Bali's southern coastal strip, this company has expanded steadily over the years. AquaMarine was founded in 1999 by Brit, Annabel Thomas who joined forces with Bali born, Wayan Suanda, who is Director of Diving Operations. AquaMarine has a large and professional office team with specialist agents dedicated to booking diving, transfers, flights and hotels. There are even people who will book resorts and liveaboards for any area of Indonesia so no matter what you want to do, AquaMarine's staff will get all manner of things organised for you. 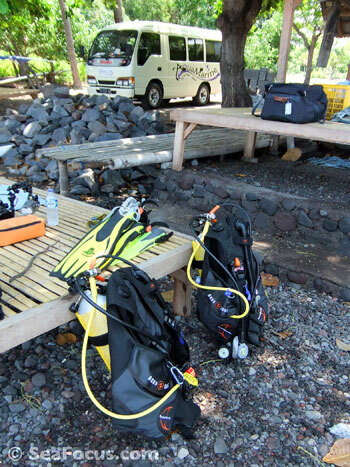 On the dive side, there is a team of full-time divemasters and instructors. Most are Balinese, while some have come from other parts of the country. There are no western or part-time divemasters, which we find to be a great advantage – all the divemasters are Indonesian, they all seem to stay with AquaMarine for a long time and they know the sites really well. 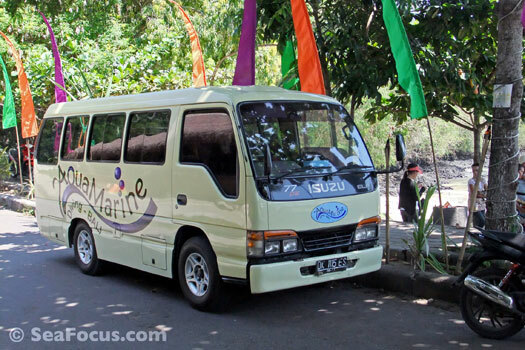 They are supported by local drivers who ferry guests around in a fleet of comfortable air-conditioned mini-vans, supplying cold mineral water and unlimited sweets to excited or tired divers. 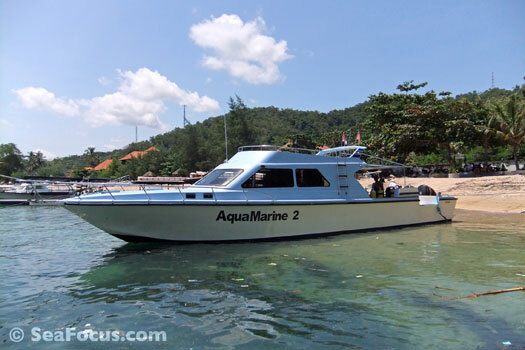 The company has three smart, well-designed day trip boats that are moored in beautiful Padangbai harbour. Rental kit is also good quality – we avoid the hassles of airline baggage allowance whenever we go to Bali, as we know AquaMarine's kit is well maintained and completely trustworthy. We have been diving with AquaMarine for over a decade – and no doubt will do for next decade – as we have always found the company to be reliable and professional. The dive guides are fun, friendly and helpful, hard working (especially with photographers) and great animal spotters. Located on the hill side of Candidasa's lone, winding coastal road, the Watergarden has almost become a home from home for us. We prefer to stay in this small village when diving Bali's east coast, as it has never become over-developed, remaining fairly peaceful yet with enough shops, restaurants and bars to keep us occupied. Many people would look for a beachfront location but this small hotel is one of our all time favourites. 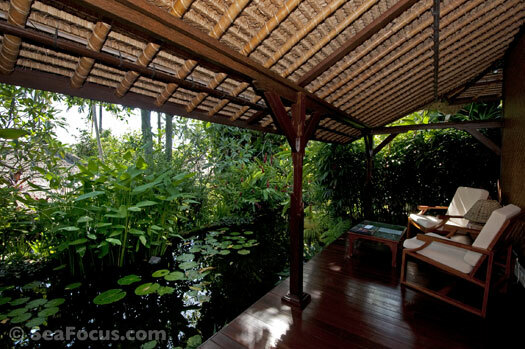 Best described as a boutique hotel, there are just a dozen individual bungalows. Each has a large deck that extends over a private koi carp filled pond, which is planted with water lilies, bamboos and flowering tropical plants. 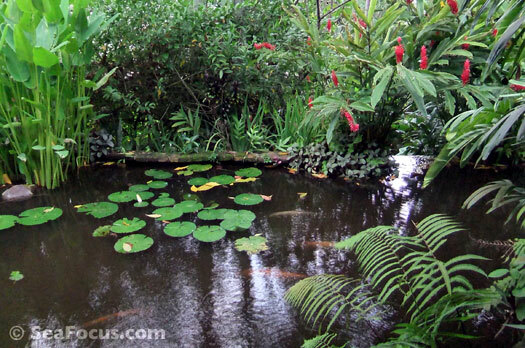 These attract numerous flitting birds, chirpy frogs, iridescent dragon flies yet few, if any mosquitoes. 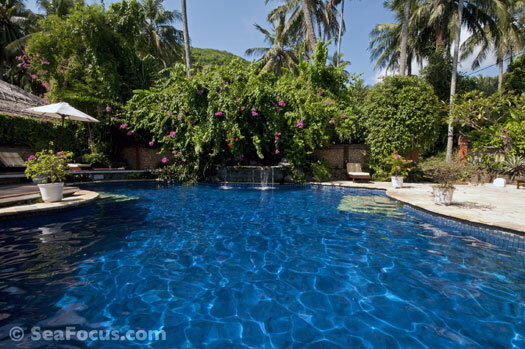 The ambience is charming, romantic and very private as the lush tropical gardens ensure you can't see the next bungalow. 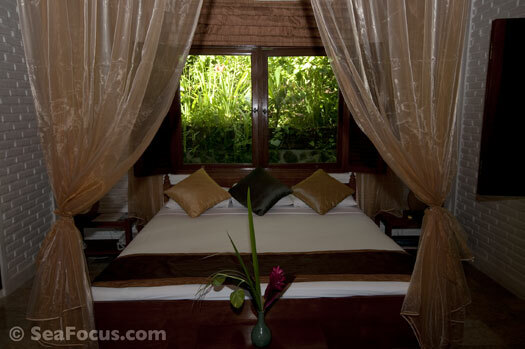 Inside, the rooms are compact but have a king size, four-poster bed draped with mosquito nets. There is air-con, a celing fan, a small fridge and coffee facilities. The bathroom is simple but adequate with plenty of steaming hot water. The hotel also has a lovely free-form swimming pool, a small spa and gift shop. 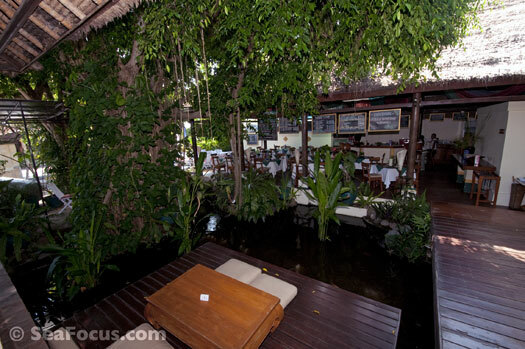 The restaurant fronts the road (rooms are hidden away at the rear) and has a huge menu including plenty of local dishes. The bar has local wines and beers, including Bali's microbrew, Storm. There is free wi-fi in the bar and restaurant and you can have cocktails (or anything else) delivered to your deck. All the staff from the Receptionists to the laundry crew (who helped hang out our wetsuits for drying) were friendly and always helpful. 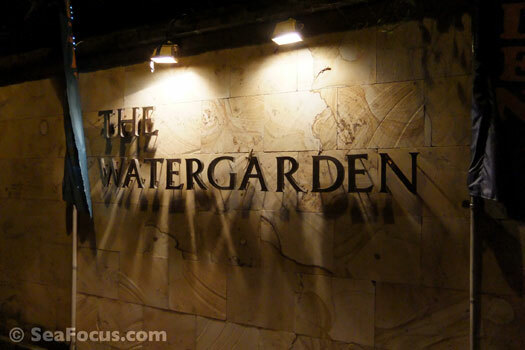 The Watergarden is owned by a British-Balinese team.